I and the Village is a 1911 painting that is currently exhibited at the Museum of Modern Art, New York. The work has been labeled as a cubist fairy tale, inspired by Eastern European folktales, presented in a dreamlike tone. Two distinct characters can be noticed in the foreground. The right side hides a green-faced man wearing a cap, staring at the goat in the left side. A man milking a sheep has been placed on the cheek of the goat. The top of the painting contains several upside-down buildings and an upside-down woman looking at a man walking next to her. The artist disregarded natural colors and used his imagination to fill the shapes defined by black contours, characterized by a cubist art style. 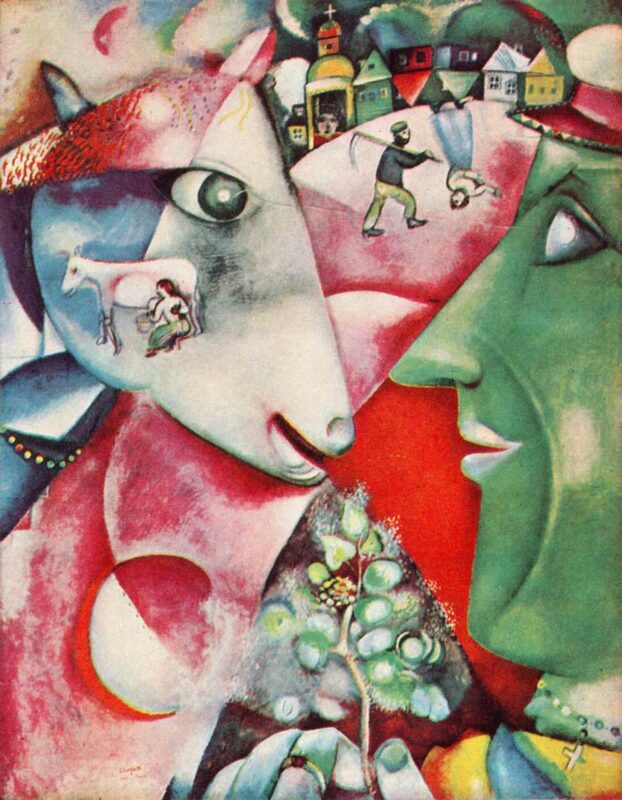 Marc Zaharovich Chagall, born in Russia in 1887, became known for his early modernist style. He was named by the critics as “the last survivor of the first generation of European modernists”. During his lifetime, the artist traveled many years visiting Germany, France, America and Russia, inspiring the artist and helping him define the style that made Picasso regard him as the last artist that understands what color really is.